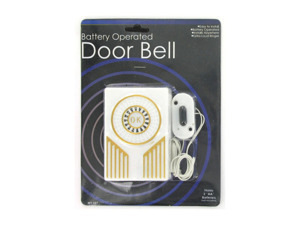 Item is a white and gold colored plastic battery operated door bell. It is available in two assorted sizes. It is easy to install and holds 2 AA batteries (not included). Item comes in clam shell packaging with UPC. Larger door bell sound box dimensions are 4" x 2 5/8" x 1 1/16", and the smaller door bell sound box dimensions are 3" x 2 1/2" x 3/4". Both ringer's dimensions are 2" x 1" x 3/8". Cord is 3 feet in length.